Chinese archaeologists are trying to solve the mystery of a long-lost Buddha statue which appeared from a lake after the water level lowered dramatically. The stone relic, found in Nancheng County in Fuzhou, could date as far as the 14th century, according to state media Xinhua News Agency. 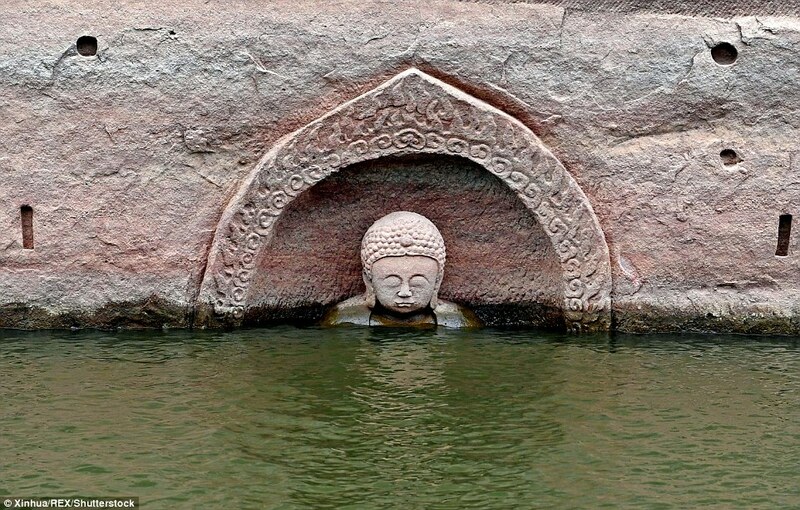 The holy figure was discovered at the end of last year when a few villagers saw its head emerging from the surface of the water in the lake in Fujian Province. The water level of Zuixian Lake, also known as Hongmen reservoir, was lowered by more than 30 feet due to a project to renovate a hydropower gate. The dramatic change in the water level has led the mysterious Buddha statue, which was carved on a cliff face, to appear. The statue seems to depict the image of the Gautama Buddha. In addition to the statue, villagers also found an imperial decree carved into the stone, Xinhua reported. After the local made the discovery, archaeologists have arrived at the Nancheng County to start an underwater detection project. Xu Changqing, head of the provincial research institute of archaeology, believed that the statue had been carved during China’s Ming Dynasty (1368-1644). Archaeologists also found rectangular holes carved on the cliff. They believed that the holes could provided proof that a temple had existed in the area. The Hongmen Reservoir contains 1.2 billion cubic meters of water and has more than 1,000 islands. According to Nancheng County’s governmental website, it was located on the site of an ancient town known as Xiaoshi. When the reservoir was built in 1958, 63 towns and villages, including Xiaoshi were completely submerged to create the lake. Dating back to 202 BC, Xiaoshi occupied a strategic location between Fujian and Jiangxi, two provinces in south-east China, and was an important trading town. The town had held the governmental seat of Nancheng County for nearly 500 years. The underwater detection project in Hongmen Reservoir is expected to last until January 15.